Dolores Ann (Kill) Amborn, was born on June 15, 1935 in rural Crookston, MN, to Steve and Mable Kill. She was baptized and confirmed at Assumption Church in Morris, MN. Dolores graduated from Alberta High School in 1953. She then began working at Morris Star & Tribune News. Dolores was united in marriage to Benjamin Edward Amborn Jr. on November 5, 1953. They farmed north of Chokio, MN until 1957. Then moved to Waphaton, ND, Hankenson, ND, Glenwood, MN, and to Fulda, MN, where they owned a heating and air conditioning business until they sold and moved to Nowthen in 1994. 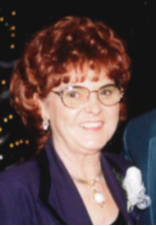 Dolores was a mother, farm wife, office worker, and active in Local Civic Affairs, as well as church, and as a director of The MN Trail Riders Association for many years. Dolores also enjoyed the outdoors, animals, gardening, especially making up to 75 apple pies a year to give out most of them. Hobbies were horses, and camping, which included trail riding in eight states and Canada. After retirement in 1999, they spent the winters in Apache Junction, Arizona, with their horses. Enjoying trail riding many miles in five mountain ranges. Dolores’ first love was her family, spending holidays, birthdays and other events with her children, grand and great-grandchildren. In October 2016 Dolores entered Guardian Angels Home On the Lake in Elk River, MN. She passed away on September 13, 2018. Left to cherish her memory is her husband, Benjamin Amborn, children: Susan (Rod) Gerdes, Jeffrey (Debbie) Amborn, and Julie (Marty) Jedlicki. Five grandchildren, four great grandchildren, and one brother, Bernard (Shirley) Kill. Dolores was preceded in death by her parents and sister, Bernadine, and infant son, Baby Boy Amborn. Funeral Friday, September 21, 2018 at 11:00 a.m.
Committal in St. Patrick Cemetery following Mass.